Have you ever noticed that kids love foods that look like things they recognize like animals, bugs, toys, people, etc.? 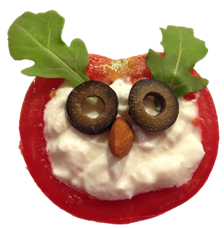 It is fun to create cute snacks that kids like and that are safe and healthy for them too! For this project students will create a kids’ snack cookbook of different snacks adults can make to nutritiously feed children. 4.4.4.Plan safe and healthy meals and snacks. 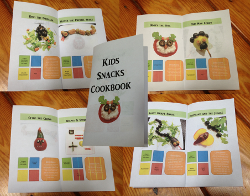 Come up with healthy snacks for kids to include in your cookbook. Write down the steps to creating each dish as you go. When you’re done making your snack, snap a picture of it to include in the cookbook. Do you have the nutritional key that you use to evaluate the recipes on the rubric? If so, can you upload it and email it to me? There is not a nutritional key. It is just a list of what food groups the snack represents. In the sample it is done by colored box. To do a nutritional analysis, I would use an online tool to submit ingredients of a “recipe” and it would tell me calorie, fat, etc. There are several of those tools available with a quick google search. I love this recipe book ! I’ve been wanting to start making them a recipe book with their favorite recipes. Pinning and making!